CAT engines covered by Platinum Plus Advantage warranty until 10/31/2018. CAT generator warranty until 06/2018 with 2900 hours. 07/2017:Hull pressure-cleaned, sanded, two coats, and SeaHawk bottom paint applied. 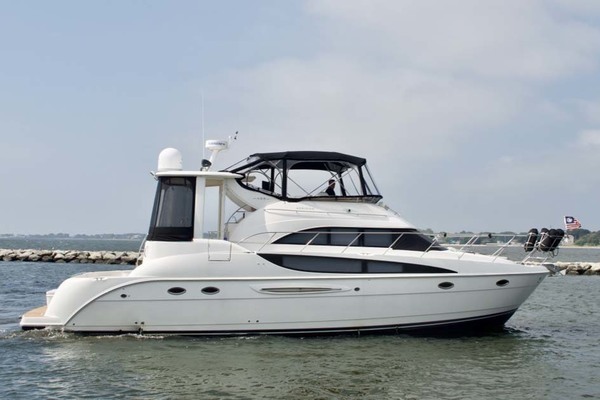 United Yacht Sales New Jersey would love to guide you through a personal showing of this 60' Hatteras 60 Motor Yacht 2009. This yacht for sale is located in Fort Lauderdale, Florida and priced at $1,195,000. For a showing please contact us by filling out the form on this page and we will get back to you shortly! 07/2017: Hull pressure-cleaned, sanded, two coats, and SeaHawk bottom paint applied. To port, going forward, a spiral staircase leads up to the open flybridge. Forward of the staircase is a light colored, upholstered, circular settee and dinette table with Brazilian countertops with Mahogany cabinetry. Going down the companionway, you will see the master stateroom is found through a Mahogany entrance door. Here the full beam master has a king mattress with plenty of storage underneath. Four large portholes on the port and starboard side of the hull allow plenty of light in. A dresser and nightstand on each side of the bed with a vanity gives ample storage. The master head has two sinks that sit atop the granite countertop and compliment the Mahogany cabinetry. A full size shower with sliding glass doors gives this spacious shower an incredibly open feel. The port guestroom has twin criss-cross berths. The VIP is located forward in the bow and features the queen size tapered berth and mahogany cabinetry. The open flybridge has all the necessities available with a large L-shaped sofa and custom-designed teak table. A refrigerator and A/C makes this a perfect place to enjoy the day. Easy access to the side decks measures 13 inches allowing access to docking and line handling. Forward you'll find access to storage lockers, located port and starboard sides and a molded-in bench seat on the bow deck. Entrance to the salon is through a three-panel sliding door framed in stainless steel. These panels stack to port to allow for an extra-large opening between the salon and aft deck for easy maneuvering. The salon features a large sofa to port and a smaller settee starboard, with storage underneath and behind the lounges. There are oversized frameless windows that provide a panoramic view. A single step up from the salon leads to the galley and country kitchen. The U-shaped galley features Brazilian granite countertops and back splashes for a long-lasting durability and good looks. An upright refrigerator and freezer provides for expanded cold storage, while a cooktop, convection/microwave oven and stainless-steel sink make you feel at home while preparing a meal. Custom-designed cabinetry with a rich mahogany satin finish provides a luxurious feel and plenty of storage. To port, a large circular dinette gives the feel of a country kitchen found on larger motor yachts and provides seating for six. Situated just aft is a stainless-steel ladder leading to the bridge above, a feature that you will not find on other boats within this size range. This boat features a true full-beam master stateroom with a king-sized berth, vanity to starboard and large fixed port lights, allowing light from the outside. Hatteras is known for their attention to detail, and wiring is one of their strongest points. All wiring is tin-coated and sealed in an insulation jacket. Wiring harnesses are tie-wrapped every 6 inches and secured every 18 inches with easy access. Wiring is color-coded and numbered at both terminal ends, and is well documented in the owner's manual. Go one step further to find their attention to detail in placement of dual light switches on both ends of the salon and companionway forconvenience. Something you'll miss on other brands. Systems monitor with programmable logic controller readout, visual and audible signals for exhaust temperature, high bilge water, fire warning in engine compartment, fire extinguisher discharge in engine room, AC power loss, smoke detectors, carbon monoxide detectors. Each Hatteras provides for a solid glass hull bottom, with beefy support for key areas like the tunnel, shaft long and strut locations. 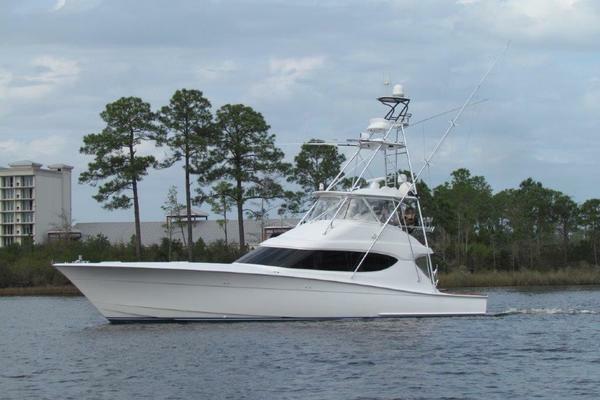 This 60' Hatteras features Alexseal paint providing a much deeper gloss than most paints. PVC foam core with layers of fiberglass laminate on each side.